Members of the European fresh produce business from all parts of the supply chain have called for the development of a new trade platform that can develop closer collaboration between the fresh produce and health industries. Marking the culmination of European Vegetable Strategies, a new one-day business forum offering ideas, information and insight for fresh vegetable suppliers, marketers and retailers, the call to action was issued during the event by Jan Doldersum of vegetable seed company Rijk Zwaan. "We believe the fresh vegetable sector must take a greater role in developing the link between horticulture, nutrition and health," said Doldersum. Asked to vote on his call to action, delegates were unanimously in favour of working towards such an objective. 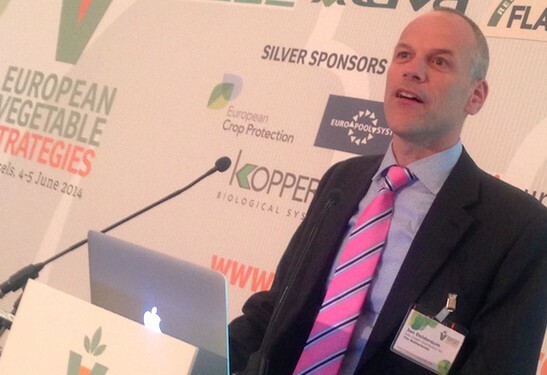 Peter Jens, global alliance director at Koppert Biological Systems, told the forum that EU funding would soon be available to support research, marketing and, by extension, business models that seek to exploit the health and nutritional attributes of fresh produce. "What we fail to understand is that the fresh produce sector has a chance to be Europe's number one health provider," he observed. "We have a massive role to play and there will be funds available." In order for the trade to capitalise successfully on the healthy properties of vegetables, the industry would need to establish some kind of association that brought together governments, R&D bodies and businesses with the common aim of identifying, assessing and marketing the products' nutritional values. Eurofruit, one of the co-organisers of European Vegetable Strategies, understands that discussions involving nine leading Dutch fresh produce companies plus health insurance companies and government officials are already "at an advanced stage" and could soon see the introduction of a new scheme to pursue that goal. The need for better promotion of vegetables' healthy attributes was underlined by new research revealed at European Vegetable Strategies by Ed Garner, communications director at Kantar WorldPanel. "In the UK, richer people tend to spend more on veg, which means the poorer you are the less you buy – that doesn't sound right," he told delegates. "Also, the more obese you are, the less you tend to buy veg. That is wrong and clearly there is a major education challenge for the veg sector when it comes to consumers."